David R. Palmer. Tracking. Part I.
Carl Frederick. The Exoanthropic Principle. Having provided a science fact article on the anthropic principle, Analog regular Frederick segues into scientist fiction covering similar themes, as a group of scientists in their little lab gain an insight into the bigger picture of which our universe is part, through communicating with a species in a 4-1 space time, through an olde fashioned dot matrix printer. Michael F. Flynn. Sand and iron. Analog regular Flynn provides a tale of a motley crew (very nautical and piratical in their nomenclature and character) who find something on an unexplored planet. Buried treasure of sorts, left behind by travellers long since past, but who still have a palpable presence. Bond Elam. A Plethora of Truth. Two rival tele-evangelists square up, metaphorically speaking. Juliette Wade. Let the Word Take Me. An exo-linguistic tale with little to distinguish it from the many that have appeared in recent years – here there is conflict between father and son over their roles and observers. A Trekkie saves the day. An alien artefact provides a mean by which an otherwise-abled individual can connect in a manner which he finds he cannot with other humans. How might robots work as behind the wheel truckers and delivery men? Dean McLaughlin. Tenderbrook of Mars. What is it that makes a hero? The eponymous protagonist is returning to Earth, a famous figure for his key role in saving the crew of a habitat on Mars. Whilst the media want to portray him as a hero, he believes that it was simply coming to the point when action had to be taken, and taking it. To explore this, we follow his journey from landing on Earth, muscle and bone weakened, to be taken to a media session, in which there is a lengthy conversation with his minder, and lengthy flashbacks to his youth and actions which marked him out as one who would stand up when the time to be counted came. 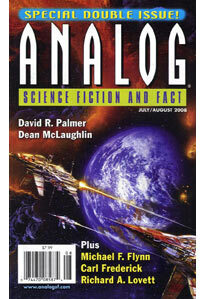 Your average Analog scientist/engineer fiction, with little to mark out any of the stories from the run of the mill. Mind you there is the interesting scientific reversal that whilst something can be easy to read in terms of characterisation, narrative and dialogue, it can be hard to get through if you’re wanting something that little bit extra.